This year Karman Healthcare is celebrating its 25th anniversary! First established in 1994, Karman Healthcare is part of the mobility industry with over 200 different types of wheelchairs. They are the nation’s leading manufacturer in wheelchair innovation. Karman provides a full line of wheelchairs, walkers, rollators, power wheelchairs, scooters, and much more. For 25 years they have been committed to finding you the perfect chair for a lifetime of use in comfort, mobility, and competitive options. Karman’s motto is “Excellence through Mobility.” Their goal is to continue to excel at bringing satisfaction to our customers through their product line of durable, stylish, and remarkably comfortable wheelchairs. Karman Healthcare products go beyond mobility devices, they serve the long term care market with a total product offering that includes beds, furnishings, bathing, mobility, respiratory, dialysis chairs, patient-care, transfer, and transport equipment. There are 5 core values that Karman Healthcare upholds: Customer Focus, Teamwork, Commitment, Innovation, and Excellence. Customer Focus: Customers come first! Which is why Karman is committed to meet and exceed the expectations of customers both internal and external building a relationship based on trust. Teamwork: A crucial part of the business. Through collaboration and communication Karman fosters a positive and proactive team that strives for improving results. Commitment: Karman takes responsibility and ownership. Here, we keep to agreements and report any deviations in a timely manner in order to find swift solutions. Innovation: Karman Healthcare continues to improve in every aspect and are open to all new ideas that can improve the business and the lives of their customers. Excellence: They are committed to the highest level of quality and it shows in both their products and services. Part of Karman’s strive for excellence is the way in which they provide information. On the Karman Website, we provide information for customers and all wheelchair users who may have questions about wheelchairs and mobility. Karman Healthcare understands that many wheelchair users and their loved ones may have questions and provide resources for a number of topics. You can find information about preventing falls from exercising in a wheelchair. Karman Healthcare also provides college and university students with scholarships to help them reach their ultimate goals in life. This scholarship is open to students who have a disability, excelled academically, and those who have a regard for disability awareness in America. 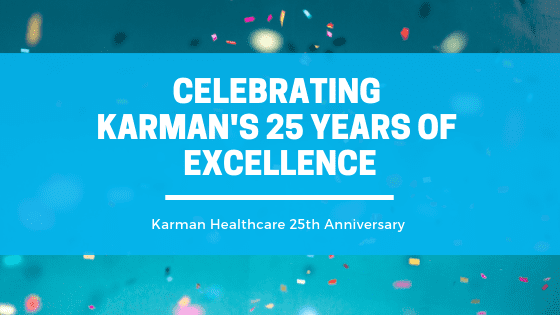 For 25 years, Karman Healthcare has gone above and beyond for their customers and will continue to do so in the future. Happy anniversary Karman and here’s to another 25 years of excellence in wheelchair mobility.